More and more people are choosing to buy homes in the Greater Toronto Area, and it’s not just because it’s the biggest city in Canada with lots to do. Toronto has a booming economy, employment is growing, the region’s economic success attracts new businesses, and because of strong demand and limited supply, real estate is resilient. Toronto has a population of roughly 2.7 million while the Greater Toronto Area has a population of approximately 6.5 million. To put that into perspective, the metropolitan region is the fourth-largest city in North America (behind Mexico City, New York, and Los Angeles), and Canada’s largest city, home to more than 20% of the entire population. This makes Toronto and the GTA, the financial and economic hub of not just Ontario, but Canada. Where other areas of the country have struggled economically of late, Toronto’s economy continues to produce strong results. This is one big reason why Toronto continues to attract a diverse, highly educated labour force. This might explain why so many large businesses (Weston, Onex, Hudson’s Bay, Royal Bank of Canada, Canadian Tire, and Celestica) have their headquarters in Toronto. It doesn’t matter what the sector or industry is, Toronto is a competitive leader, from technology to green energy, from fashion and design, food and beverage, music, film and television, industry, and technology. Is it any wonder so many people are relocating from across Canada, and around the world, to live in Toronto? 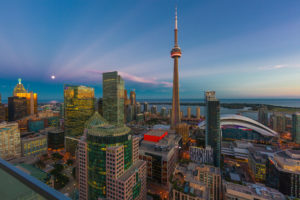 When it comes to economic opportunity and quality of life, Toronto comes out on top, ranked as the world’s third-best major metro area to live and work (out of a list of 30). In fact, it was the only Canadian city to rank in the study conducted by PricewaterhouseCoopers (PwC). One of the city’s weak spots though, was housing costs. In other words, Toronto’s strong housing market is making it difficult for some homebuyers to find their dream home. On top of that, current monetary policies, including stricter lending rules and higher interest rates, are squeezing out many homebuyers who would have once had no trouble qualifying for a loan from a traditional lender. To get on the property ladder in Toronto, higher quality borrowers are turning to Mortgage Investment Corporations (MICs), like Mortgage Company of Canada. And for these same reasons, Toronto and the GTA are one of the best places for accredited investors to invest in mortgages secured by residential real estate. In an effort to prevent a housing crisis in Canada, like the one that recently gripped the U.S., the Federal Government implemented a number of strict lending rules. This, coupled with higher interest rates, has made home ownership untenable, even for those who would have, just a few years ago, had no trouble securing a mortgage. These headwinds are actually responsible for showing higher quality borrowers how convenient, flexible, faster, and easier it is to work with Mortgage Company of Canada. Normally, there is a risk/reward trade off with yield; the higher the yield the higher the risk. Our objective at Mortgage Company of Canada is to provide investors with an attractive risk-adjusted return by investing in mortgages secured by single family homes in the GTA. Today, our diversified mortgage pool is made up of more than 700 mortgages with an aggregate value of $228 million.4 Because of the strong real estate market in the GTA, our portfolio has increased by 70% over the last 12 months. In addition to having a leading management team with extensive experience in real estate, the risk market, and the public market, Mortgage Company of Canada is overseen by an independent majority board, something unique to the entire MIC industry. Because of this, Mortgage Company of Canada has been able to provide investors with an above average, annual dividend yield of 9.65%4, with distributions paid monthly. Had you invested $100,000 with Mortgage Company of Canada in 2009, in November 2018, that investment would be worth $262,880. 1. “Strong Economy,” City of Toronto web site, last accessed January 24, 2019; https://www.toronto.ca/business-economy/invest-in-toronto/strong-economy/. 2. “Toronto’s Economy,” City of Toronto web site, last accessed January 24, 2019; https://www.toronto.ca/city-government/council/2018-council-issue-notes/torontos-economy/strengthening-torontos-economy/. 3. “Cities of Opportunity,” PricewaterhouseCooper, last accessed January 24, 2019. 4. “December Newsletter,” Mortgage Company of Canada web site, last accessed January 4, 2019; https://www.mcoci.com/wp-content/uploads/2019/01/Mortgage-Company-of-Canada-December-Newsletter.pdf.